Don’t let errors slow down your store. Find out how to fix ’em yourself or how to get the support you need. Errors in your store may occur when you’re collecting payment on an order, importing a CSV file, or even running a shipping calculation test. In some cases, you'll see an error message that tells you what went wrong, but many of these error messages are generic or confusing. If you need a helping hand, you can always submit a ticket to our Support Team. Or, if you’re an advanced user, you might want to take a DIY approach to troubleshooting. If you fall into the advanced category, we’ll give you a breakdown of a few tools you can use to analyze your store's data and pinpoint the causes of common errors. If the error you're troubleshooting occurred while collecting payment or testing shipping rates, there's a good chance you can find the cause by checking your store's app logs. Among other things, the app logs (short for "application logs") contain data that gets sent between your Volusion store and an external application, such as a PayPal or FedEx. The app logs for your store are easy to access through your FTP. If you haven't created or used an FTP account for your store, be sure to follow our guides on setting up and using your FTP before proceeding. The FTP account you use must have permissions to view the /logs/ directory or higher. 1. Log in to your store's FTP. 3. Each app log file contains data from a specific month in the last year. For example, "AppLog1611.txt" contains data from the year 2016 (16) for the month of November (11). If you're looking for data from January of 2017, you'll need the text file called "AppLog1701.txt". 4. Save a copy of the appropriate app log file to your desktop, then open the file in a text editing program like Notepad or Notepad++ (PC), TextEditor (Mac), or Sublime Text. If you don't see any app log text files in your logs directory, you may need to locate them by opening the directory that begins with W3SVC (the other numbers in this folder name represent the Volusion server where your store is hosted). Your FTP stores a year's worth of app logs from your Volusion store, so you should see 12 separate "AppLog" text files -- one for each month. Shipping errors can occur when you (or a customer) enter a zip code on the shopping cart page and attempt to get shipping estimates, or when you run a shipping rates test from your Admin Area at Settings > Shipping. 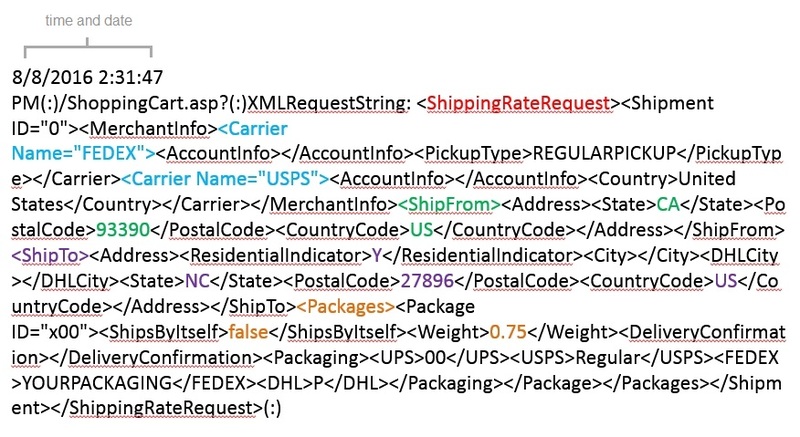 If your store displays an error while trying to pull a shipping rate, it's helpful to check the current app log to see what data is being sent from your store to each shipping carrier (the "request") and what data the carrier is returning (the "response"). Download the most recent version of the current month's app log file from your FTP, then check the last few lines of the document for the most recent request / response. Your Volusion store will only include information for active shipping methods in a request, so the number of responses you see in your file may vary. The response for the above request would appear on the very next line. Typically, you'll be checking the information being sent from your Volusion store in order to verify its accuracy; an incorrect postal code, a business address designation, or even a "ships by itself" designation on a product could be impacting the available rates (or lack thereof) you see in the response. The majority of PayPal transaction details in the app logs will be redundant or irrelevant to you as a merchant, but it's helpful to know where to find them. When collecting payments from the Orders > Process Orders section of your Admin Area, you may have noticed that each order contains a Payment Log section. For PayPal order, this section contains a transaction ID that's unique to that specific PayPal payment transaction. 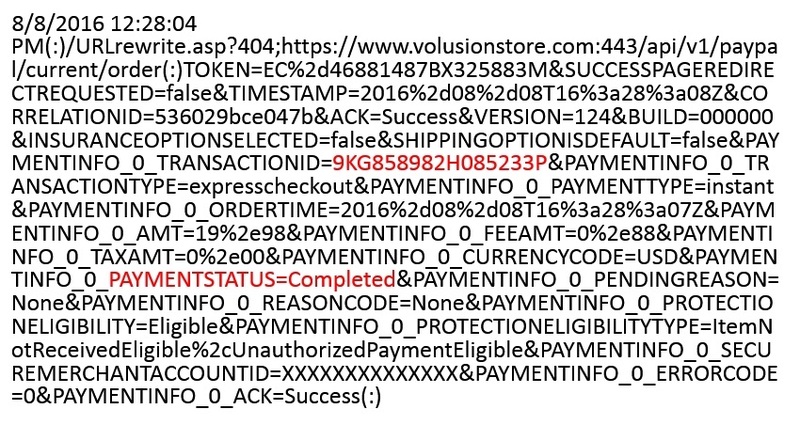 If you receive a specific error number or message when processing a PayPal transaction in your Admin Area, be sure to check our PayPal Errors in Volusion article for a list of the most common reasons. If you're still stuck, contact PayPal or Volusion Support. If you're using a payment gateway to process payments, the DataVault logs are a helpful way to view payment processing errors. You can see some of the same data by exporting a CSV file of the Payment_Log table from your Admin Area (Inventory > Import/Export > Standard Export, but the DataVault logs contain more details. 2. From the top level directory (/), open the logs directory. Within this folder, you should see a list of text files titled "DataVaultAppLogXXXX.txt", where XXXX represents a specific year and month. 3. Each DataVault log file contains payment transaction data from a specific month in the last year. For example, "DataVaultAppLog1602.txt" contains data from the year 2016 (16) for the month of February (02). Note that when you download a DataVault log file from your FTP, you'll be viewing a whole month's worth of data at a time. We recommend using CTRL + F on your keyboard to search for the relevant order ID number. As a merchant, you have access to great deal of data associated with your store; however, some data won't appear in your FTP. If you see an error message when attempting an action through your Volusion integration with eBay, Amazon, or Facebook, the error data won't be available in your FTP logs. These errors typically appear as messages in a pink-shaded bar, and they're specific to API functionality (your Volusion store using the API to communicate with third-party apps and services). Depending on the action you attempted before receiving an error message like the ones described above, our Support team may have some additional steps for you to try. In cases where it's necessary to obtain additional data for troubleshooting, the Support team member you're speaking with may open a request with our IT department. You've probably seen a few frustratingly generic error messages on various websites. The messages associated with these errors may be as simple as "Internal Server Error", "Timeout Expired", or "Missing Path", but they don't offer much additional information. 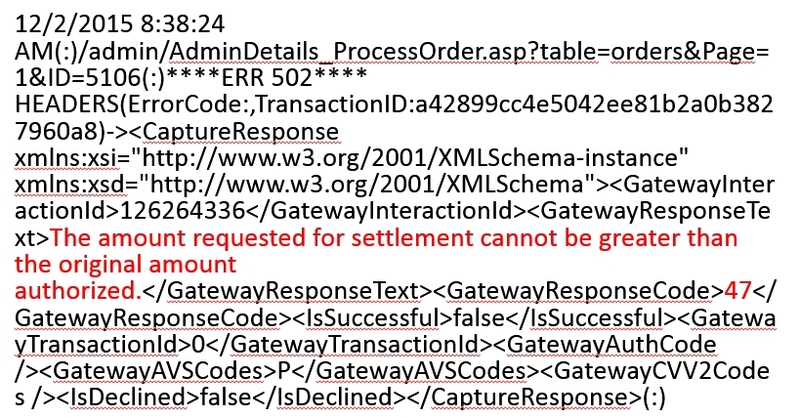 These errors can happen for any website that utilizes SQL servers, making them a common occurrence on the web. As with any error, our Support team may have some general ideas for you to try -- particularly if you can remember the actions you took before the error occurred and can help us replicate it. Errors happen. If you’re a savvy admin, you can bust out your toolbox and fix them yourself or contact Volusion. Our support team is always here to help you troubleshoot those irksome errors so you can get back to business!